It’s never a good feeling when you notice stains on your teeth. They surface for a number of different reasons, from food to aging to enamel erosion. Having healthy, clean teeth isn’t just beneficial to your overall wellness, it also affects your confidence and how you present yourself to the world. If you’re wondering how to whiten teeth naturally, you’re in for a treat! 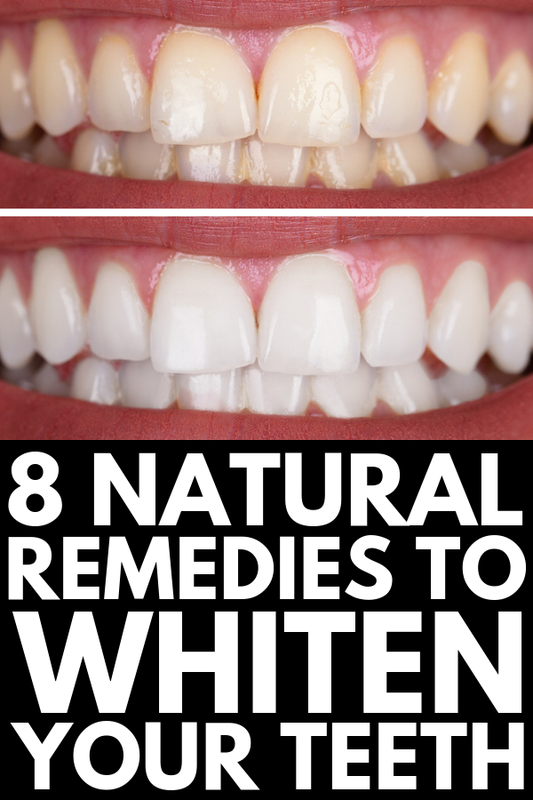 Take a look at 8 natural teeth whitening tips and products that work! There are a number of reasons teeth become yellow. As we get older, our teeth naturally become less white due to enamel wearing away from everyday things we do like chewing, and exposure to acid from food and drink. Teeth can also become yellow when the enamel is thin and the dentin (a deep yellow/brownish material) underneath it shows through. A wide range of food and drink can stain your teeth yellow as well. Foods such as berries and tomatoes in pasta sauce contain pigments that stain the surface of your teeth. And coffee and tea, along with red and white wine are also some of the biggest culprits for the yellowing of teeth. Smoking cigarettes is another one of the worst offenders for yellow teeth. Think of it this way: Any food or drink that could stain your clothes can also stain your teeth. Acidic foods and beverages can also lead to staining because they erode your enamel more easily, and make it easier for pigments to latch on to. Medications such as antibiotics can also lead to tooth discolouration, as can not properly caring for your teeth. Inadequate brushing and flossing and not going for regular dental cleanings can all lead to a buildup of plaque on the teeth, causing yellowing. Since food stains can be a major source of tooth yellowing, make sure to brush your teeth after every meal. When you clean your teeth regularly, you have less chance of plaque buildup and staining. Also make sure to brush your teeth after you drink coffee or tea. You’ll also want to rinse your teeth when you can. If you can’t get to the bathroom to brush your teeth after eating, at least take a swig of water, and swish it around in your mouth before swallowing it to rinse your teeth as best you can. Coffee and tea are two of the biggest perpetrators for yellowing teeth. Limit your coffee intake and try drinking more water to increase your energy and focus instead. Make sure to use a soft toothbrush and scrub as gently as possible when you’re brushing your teeth to prevent wearing away the enamel. As we mentioned above, when your enamel wears away it allows dentin to show through. A whitening toothpaste can remove surface stains on your teeth before they get the chance to set in. If you’re diligent with brushing your teeth after every meal with a whitening toothpaste, it will help prevent tooth discolouration. Bleaching, or traditional teeth whitening involves a gel-like solution that is rubbed on your teeth while your dentist shines a light on it to activate it. The process takes about an hour. Whitening strips are dental strips with a whitening agent inside. They adhere to your teeth and are suitable if you have mild staining and lots of tooth enamel. These can cause sensitivity and irritation of the gums if the strips are too big for your teeth. Natural products like baking soda and coconut oil and are effective natural teeth whiteners. If you don’t love the idea of more intense teeth whitening, natural products are the way to go (you can check out our list of the best natural teeth whitening remedies below!). One of the main risks with traditional tooth whitening is tooth sensitivity, which occurs mainly in the hours following the treatment. Gum irritation is another risk of traditional tooth whitening. Teeth whitening will not cause permanent damage to your gums, but gum irritation caused by the teeth whitening gel is known as a chemical burn and is comparable to sunburn. The tissue will recuperate in about 24 hours. Since the bleaching solution in traditional teeth whitening is much more powerful than over-the-counter or natural whitening products, your teeth will brighten up to 6x whiter than they are now. Traditional tooth whitening is personalized exactly to your teeth and the results you want. While other options such as whitening strips are a one size fit all type of deal, traditional tooth whitening is more customized to you. If you’re not ready to get your teeth professionally whitened, you can try natural teeth whitening products instead. These are three of the best ways to naturally whiten teeth! Oil pulling is an ancient detoxification method that’s still used today. Oil pulling makes your teeth whiter by keeping your teeth slick, and in turn, making stains less likely to stick to your teeth. Swish coconut oil around in your mouth for a few minutes, and then spit it out. The bacteria in your mouth gets trapped in the oil, leaving your mouth when you spit it out. Bacteria can cause plaque to form on your teeth, making them look yellow, so removing it is key. Coconut oil also keeps your gums healthy, which helps with everything from bad breath to tooth decay. Apple cider vinegar is a natural disinfectant and its main ingredient, acetic acid, kills bacteria. Since ACV has antibacterial properties, it helps clean your mouth and whiten your teeth. Make sure to dilute with water before swishing it around your mouth, and don’t use it everyday, because it’s also quite acidic so can lead to enamel erosion. Baking soda has effective whitening properties, which is why it’s so often used in whitening toothpastes. Since baking soda is a mild abrasive, it can scrub away surface stains on the teeth, and it also prevents bacteria from growing in your mouth. Mix one teaspoon of baking soda with 2 teaspoons of water and brush with the paste a few times a week. These are the best natural ways to whiten teeth! If your teeth could use some brightening, try out these tips and products! If you loved this post on how to whiten teeth naturally, please share it on Pinterest! And if you’re looking for more beauty tips and tricks, make sure to follow our Beauty Board on Pinterest!